What teacher does not love the Target $1 Spot? I have yet to meet one. $1 deals are great especially when you can turn them into hands-on, student centered learning opportunities for your classroom. Keep scrolling to see how I turned a $1 pack of borders into a literacy center for my kinders. I actually got this idea last year and used it in my classroom. My students loved the letter center so much that when I saw the new alphabet borders this year... I just had to get them to add to our collection. It's a simple, effective, and fun literacy center for roughly $3 that will last the year and years to come. The prep is easy and fast, I promise. I'm all about using my time efficiently and this took me about 15 mins to prepare. Start with your "chip" clips and leave them on the white paper they're clipped to in order to save some prep time. Using the marker, write all the lowercase letters from a-z on a different clip. Once you're done and the clips are still intact, place a few glue dots onto the clips and start pressing on your *optional* decorative piece. The border comes split. To make it whole and sturdy, you will need to connect the two pieces with a small piece of tape on the back side. (Last year, I laminated my borders both long and stacked just to see student preference. For long, I let the kids use the pieces on the floor and stretch out.) 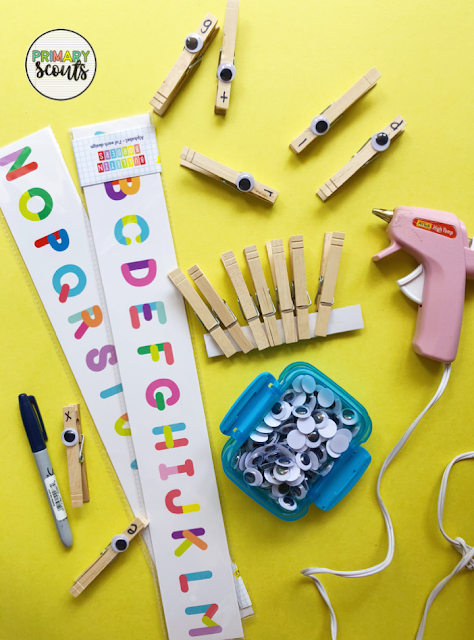 Once your arrangement is connected, you can run the pieces through a laminator to make it sturdy for long lasting use. There you have it! A very low-prep and cheap literacy center for your primary learners. In centers or at the teacher table, each student will get a alphabet border and share a bucket of alphabet clips and practice matching upper and lowercase letters. 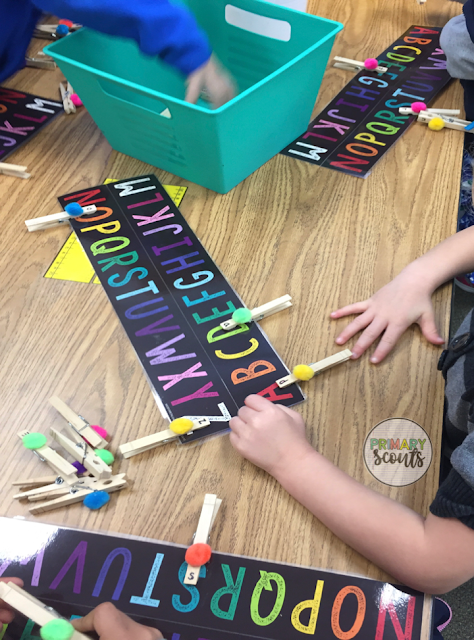 Students will pull a lowercase clip form the bucket, say the lowercase letter, and match it to the corresponding uppercase letter on their border mat. For stacked borders, they were able to sit at the table with enough room to complete the activity. To store clips, I tossed all my clips into one bucket. I did make enough clips per border. 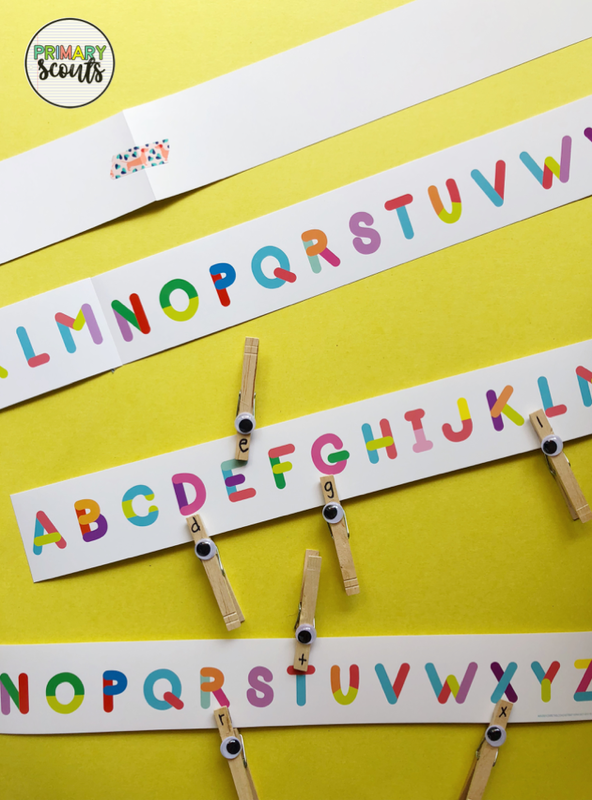 Example: (5 borders, 5 sets of alphabet clips). 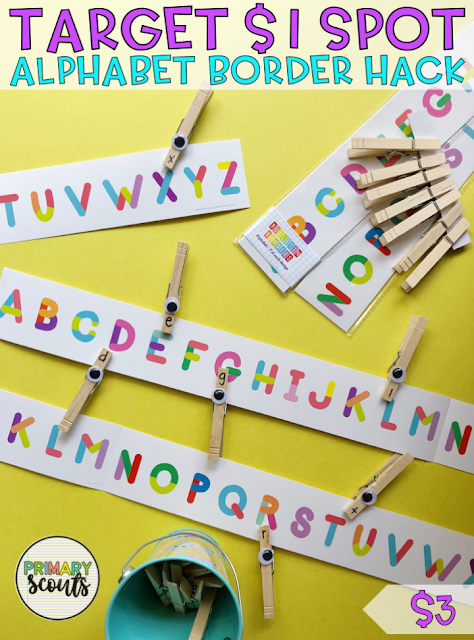 To store the borders for easy student accessibility, I clipped them all together with a binder clip and hung the clip onto a magnetic hook against a magnetic storage cabinet in my classroom.